Meaning far-out flavor! Plus, I wasn’t exactly sure what ethnic category this stew belonged in. I started out thinking I was going to make an Indian curry dish, and ended up somewhere in Africa. Either way, I knew I didn’t want a standard lentil stew. 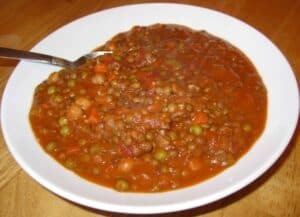 Regular lentil soup can conjure up images of potluck feeds and I received a bored look when I told BL I was making a new lentil soup for dinner. Lentils often gets a bad rap but to me they are a perfect. Ready to soak up any spices you pair them with, light but satisfying enough to fill you up… not out. This was definitely a one-way trip into flavor town. I used green french lentils in this but you could use brown. I prefer the green ones and use them in most of my dishes. No matter what type you choose, you are eating one powerful legume! They are a good source of folate, fiber, protein and iron. Need I say more? Bring 2 cups water to a boil. Add lentils, reduce heat to medium and cook until tender. In a separate large stockpot, add 3 tbsp. canola oil, garlic, ginger and onions. Stir until onion is translucent about 5-10 minutes. Add the carrots, celery and spice blend. Stir to combine and cook and additional 10 minutes until the carrots are soft. If the vegetables start to stick, add a bit of vegetable broth. Add the diced tomatoes, tomato paste, vegetable broth and butternut squash soup. Stir together and bring to a boil. Add the lentils, peas, and beans. Reduce heat to a simmer and let cook for 30-40 minutes. Yum! We had it over brown rice one night and with crusty bread the next day for lunch.